When she learns that her high school sweetheart has returned to her hometown of Napa, California, Marlo is ready to leave behind her comfortable life in Malibu, and marry the supposed love of her life, Josh Hampton. However, when she arrives to Napa with her best friend Phoenix "Nik" Stavros, Marlo realizes that her perfect, ideal love-life with Josh may not work out to be as wonderful and exciting as she had originally hoped. Instead, Marlo must work out the relationship mess she's gotten herself into - should she pursue her long-time dream of a life with Josh, or should she cross the friendship boundary with her best friend Nik? 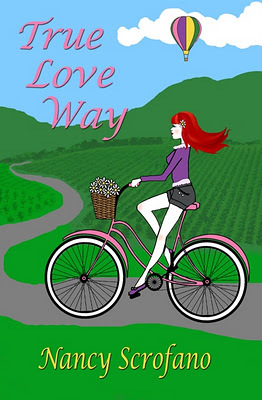 True Love Way is more romance than general fiction, and is chock-full of interesting "vintage-type" homages and jargon some old-timers might really appreciate. "Vintage and retro" is pretty much Marlo's entire personality, and her character is just a bit borderline-obsessed with everything from before her time. I actually found it fascinating that the men in this novel find Marlo attractive, and not at all annoying! The men I know probably couldn't run away fast enough from Marlo, especially if she busted out her DVD collections in front of them. I'm all for classic movies and music, but I think some shows (such as Mork and Mindy) are just not as timeless and epic for the masses. The plot has a very good rhythm - seasoned readers might pick up on clues early on about Josh's situation, but Scrofano definitely surprises us with her timing. True Love Way has a very comfortable pace and fun storyline, which promises that Scrofano's future novels are likely to be just as enjoyable, if not more. True Love Way's one major downfall is the maturity of its characters, all of whom demonstrate teenage-like behavior throughout the novel. For being men and women in their late 20s and early to mid-30s, none of them really seem to grasp maturity in regards to effective and fair communication. Throughout the book, many of the characters become upset with one another over incidents that occurred years ago either in high school or college. Additionally, there are moments in the book when Marlo passes notes to a friend in the car, and initiates games right in the middle of serious discussions to help everyone relax and calm down. If any of my friends demonstrated those types of behaviors during serious moments, I'd probably shake them until they came to their senses! True Love Way actually reminded me a lot of Hollywood Ending by Lucie Simone. It wasn't until I finished reading this novel that I realized both books were published by the same press, which totally makes sense! If you enjoy novels like True Love Way, you'll probably also enjoy Moonlight and Oranges by Elise Stephens, The Debutante by Kathleen Tessaro, and Always Something There to Remind Me by Beth Harbison. Click on any of these book images to review them in more detail on Amazon.com. What are your favorite contemporary romance novels? Share your thoughts and comments with us below.